Vegetarians, bless your hearts, the Super Bowl isn’t your holiday. I’ve never once seen tofu sausage balls at a party on the big day. To underscore the carnivorous nature of the big game, which is coming up this Sunday, have a look at these stadium models made of cold cuts (with some crunchy snacks and Rice Krispie treats). My thanks to Jan Norris for alerting me to these masterpieces of the meat arts. It’s not too early to start thinking about the game day menu. There are several ways to approach it. There’s the grazer option: A continuous supply of finger food such as guacamole, wings, deviled eggs, the aforementioned sausage balls, etc. This allows for continuous feeding to maintain a level game-watching energy. Another is the bowl game idea: A few snacks until half time, when you bring out big pots of chili (beefy chili, that is). The danger in this approach is you run the risk, as the host, of being so busy putting out the food that you miss a possible wardrobe malfunction. But it does give your guests something more substantive to absorb any beverages. I agree that Greg Cox got it right in The News & Observer today with the majority of his best restaurant picks for 2011 in the Triangle. I certainly agree with the top pick, Magnolia Grill in Durham, N.C.
It’s easy to forget that, long before the boom in Triangle restaurants and when the idea of “eat local” made diners scratch their heads, chef Ben Barker was out in front. Twenty years ago, the fact that he asked local farmers to actually grow produce just for him was weird enough to warrant articles. Now, connecting with local producers is an accepted fact for restaurants with any aspirations. Not to mention the restaurant kitchens that are populated with Magnolia Grill graduates. Read the rest of the list here and see what you think. For a magazine who knows North Carolina, the current issue of Our State is food themed and stuffed with sweet goodies. The cover, showing a maple syrup and, yes, country ham cake, should have been printed in scratch-and-sniff. I was out of leftovers. No time to go to the store. No desire for takeout. So I stuck my head in the refrigerator to see what was there. Sweet potatoes – well, one of the three I found was still good. Some fresh ginger from making a sample recipe. At the bottom of the crisper, gold: An entire bag of carrots. And there was still some homemade chicken stock in the freezer. A well-stocked herb/spice pantry helps considerably with this kind of improvisational cooking. A jar of dried lemon peel and some ground cardamom emerged from mine, which is actually in a drawer. Yes, I alphabetize my seasoning drawer. So there. What emerged from all this was soup. I gently cooked half of a large onion in olive oil until it was almost soft, then tossed in about a teaspoon each of cardamom and the lemon peel. Cooked that for a few minutes, then added 1-inch chunks of the peeled sweet potato and about four of the carrots, about two teaspoons of chopped fresh ginger, about 3 cups of chicken stock and a little salt. I think I threw in a little more cardamom, too. I brought it all to a boil, covered the pot, and simmered about 30 minutes, until the potatoes and carrots were soft. I got out my favorite kitchen power tool – the immersion (or hand) blender – and pureed it all. SHAMELESS SELF PROMOTION: I’ll be on the My Carolina Today show on NBC-17 in Raleigh on Monday, Jan. 30, talking about that classic Super Bowl snack, wings. The hour-long show starts at 11 a.m., but I’m not sure when I’ll be on. I baked some sweet potato fries the other night. I love them, but they do not get crispy like deep-fried fries. They stay a little soft in the middle, but they’re still great. It’s just part of who they are. Cutting the potatoes no more than half an inch thick helps with crispiness, as does keeping the skins on. I gave them extra oomph with this spicy salt. I don’t heavily salt my food, so I like it to count. This blend, based on a recipe from “Fast, Fresh and Green” by Susie Middleton (Chronicle Books, 2010) could be used on white potatoes, or even grilled salmon or chicken. I used a Hawaiian salt, but any kosher or sea salt would do. Combine everything in a small bowl. Store in a covered glass jar. Green leafy things have been pouring into my kitchen, as if a UFO (unidentified frond-filled object) had landed there. Olive oil and a hot frying pan are all that very fresh greens often need, and sometimes I toss them into tomato sauce for pasta or stuff dumplings with them. But I was looking for a change. Combine culinary restlessness with the greens and a freezer full of newly prepared chicken stock, and soup came to mind. I tried a recipe using chard and lentils from Barbara Kafka’s “Soup: A Way of Life.” I know I’ve mentioned this book before, but the recipes are always interesting. For this one, however, I’d make some changes. First of all, the recipe makes an extremely thick soup, more like a stew. I added more stock because I wanted a more liquid soup. Also, maybe because I added liquid, I would double the paprika and cumin for more flavor. For vegetarians, I would suggest using vegetable stock, not water. Kafka says to use chard, but I think any kind of medium-flavored leafy green would do. I don’t know why I don’t cook with lentils more often. They don’t have to be soaked, cook quickly and are small enough to play well with other ingredients in a soup or stew. Here’s the recipe with my changes. In a medium saucepan, heat the olive oil, paprika and cumin over low heat, stirring, until the spices are fragrant, 2 to 4 minutes. Stir in the green onion whites. Cook until wilted, about 5 minutes. Stir in the lentils, stock and garlic. Bring to a boil. Lower the heat and simmer for 20 to 30 minutes or until the lentils are almost done. Stir in the green onion greens, chard, cilantro and lemon juice. Simmer for 5 to 10 minutes, until the chard is cooked through and the lentils are soft. Taste, then season with salt and pepper. This is what happens when you fall in with a crowd of Scots: Eventually you have to drink Scotch, which tastes like I fell face down into my backyard; and you have to deal with haggis. I had naively hoped I could avoid the legendary haggis, despite hanging with this crowd of ale-drinking musicians who call themselves the Raleigh Scottish Fiddle Club. We meet monthly at 518 West in Raleigh, an Italian restaurant. The ringleader is the chef there. No haggis in Italian cooking. I was safe. Then someone suggested holding a Burns Night. Scots around the world celebrate the beloved 18th-century Scottish poet Robert Burns (who wrote the New Year’s Eve song “Auld Lang Syne”) with Burns Night or Burns Supper events on or near his birthday of Jan. 25. There is the playing of Scottish music, especially Burns’ songs; the reciting of poetry in indecipherable Gaelic; and the consumption of a traditional Scottish meal. Which means haggis. 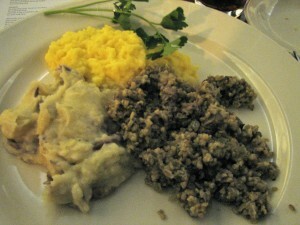 Burns wrote “Address to a Haggis,” ensuring that it would become the national dish of Scotland and the centerpiece of the meal in his honor, along with “neeps” (turnips) and “tatties” (potatoes). Well, I thought, I’ve eaten chitlins. How much worse can a sheep’s bladder stuffed with oats, suet and organ meats and then steamed be? Besides, I had faith in our leader, chef Blaine Nierman, and I offered to be his sous chef for the haggis. Blaine created a 21st-century haggis, not an 18th-century one. No mystery meats. There was beef and lamb plus calves’ liver, with onions, lemon juice, steel-cut oats, pepper and nutmeg. We cut and sauteed the meats, and combined it all in a big bowl. “This isn’t in the recipe,” Blaine said as he tossed in a jigger of Scotch, “But it can’t hurt.” We used cooking bags, like you use to roast the Thanksgiving turkey, instead of animal containers for the mixture. The bags steamed over simmering chicken stock for a hour and a half. That night, after the playing of music by the unrehearsed and the orating of Burns’ lines by men in kilts, the haggis was marched through the assembly on a silver tray, accompanied by bagpipes. It had a strong lamb flavor, and looked a little like Hamburger Helper. Not frightening at all. With all that meat, it was a fairly heavy dish. If I’d been struggling through a Scottish moor in the rain, it would have been perfect sustenance, but for a warm Southern winter’s evening, it was a bit much. But nothing to fear. So, all hail the haggis…once a year. The Darth Maul burger (they misspelled him, too) isn’t as evil, with only black seeds on the top of the bun. Of course, the Jedi burger’s bun is a pristine white. But I’m not sure if those are chunks of onion or – Obi-Wan forbid – mini-marshmallows on top. Look for yourself here. That black bun is more off-putting than being trapped in the Millenium Falcon with a soggy wookie. George Lucas, call your copyright lawyer, please. Welcome to January, or as it’s called at my house, National Carrot Sticks Month. Now is when we feel we should pay for the indulgences of December, but I don’t think that means we should suffer. In Sunday’s New York Times Magazine, the always interesting Mark Bittman proposes having a vegan day each week. Well, I don’t know if I’d go that far, but his recipes intrigue me. They are far more interesting than the usual roots and berries I see in vegan cookbooks. See what you think here. I’ve been looking at vegan options due to The Hub’s dairy allergy. And, no, it doesn’t mean he can’t eat eggs, as countless people have asked me. The last time I checked, eggs didn’t come from cows. This Christmas, I began to miss the creamy mashed potatoes I used to make with our standing rib roast. In a new cookbook, I found an alternative. Barbara Kafka’s “The Intolerant Gourmet: Glorious Food Without Gluten and Lactose” (Artisan, 2011) includes a number of interesting options, such as risotto, which is usually packed with butter and cheese. But she doesn’t expect you to look for vegan cheese and such. I’ve had very back luck with faux cheese and would rather just avoid it. I was also interested in the book because Kafka’s books are excellent – I’ve used her “Soup: A Way of Life” for years. I tried Kafka’s recipe for mashed potatoes using olive oil, and it was great. She advises starting with potatoes that don’t have too much starch, such as red or fingerling potatoes and avoiding the traditional high-starch mashing potatoes, such as russets and Idahos. I think pressing the potatoes through the food mill helped with the texture. I did not make the garlic oil because one of my guests was sensitive to garlic, but it could only make them better (I added the olive oil straight to the potatoes). They were even pretty good the next day. Place the garlic and oil in a small saucepan over very low heat. In a medium saucepan, bring 2 quarts water to a boil. Add the potatoes and reduce the heat to simmer. Cook for 10 to 12 minutes or until the tip of a sharp knife easily pierces a potato. Drain. Place the potatoes back in the pot to dry out for 2 minutes. Pass the potatoes thorugh a food mill fitted with the fine disc into a large bowl. Strain the garlic oil into the potatoes. mix with a whisk and season with salt to taste.